I wondered if those lyrics were intended to express irony, as if Queen were mocking millennials or the present generation, rather than admiring their point of view. "I Want It All," I recognize as a perfect millennial anthem. Apparently band member Brian May wrote the words at the time he had left his first wife for a second, the words serving as a defense of the relationship. Lead singer, Freddie Mercury (born Farrokh Bulsara), perhaps got what he wanted, but he also contracted the HIV virus, then full blown AIDS, something nobody would want, and died age 45 in 1991, two years after "I Want It All" was released. What people want in relationship and what God designed or what scripture teaches conflict with one another. You can't actually "have it all," even if you want it, unless you mean that you are committed to wait for it and then inherit all things in and through Jesus Christ. That is usually not what people mean when they say, I want it all. Maybe the key is, they want it, now. They want the relationship that they want, even the one they have with God -- they want that to be like they want it. Nobody gets a relationship with God by subjugating God to his desires, what he wants, but by submitting his wants to God's wants, just like Jesus did with His Father. No believer is better than another believer. Peter expresses it as "like precious faith" (2 Pet 1:1). The equality arises from "his divine power [having given] unto us all things that pertain unto life and godliness" [2 Pet 1:3]. Everyone has equal opportunity to live as obedient a Christian life as anyone else. God's grace is available to every believer to an equal degree. God is light. Everyone in a church walks in the same light of God, equal to everyone else. Everyone has sinned. Everyone has an equal advocate with the Father. The Jews in Ephesus elevated themselves above the Gentiles, but Paul wrote that every believer in Ephesus was blessed "with all spiritual blessings in heavenly places in Christ" (Eph 1:3) and "have access by one Spirit unto the Father" (Eph 2:18). No one believer breathes some unique brand or blend of pure spiritual air. Every person has equal value, is equal in essence. Role doesn't determine worth. Relationship, however, is still hierarchical, a God ordained hierarchy. An older person is equal to a younger person, but the younger person in a church is not to rebuke the elder, but to entreat him as a father (cf. 1 Tim 5:1). Of course, the implication is that a son is only to entreat his father, and even a younger man should entreat an older man. God ordained hierarchical relationship. The false idea of horizontal, the misnomer, is the postmodern elimination of distinctions. It proceeds from a wrong view of God. Distinctions exist in the Trinity. The Father, the Son, and the Holy Spirit are three different Persons. In evangelicalism the distortion of God reaches to the incarnation of Jesus. Jesus didn't come to be like us. He came to make us like Him, as Peter wrote, to "be partakers of the divine nature" (2 Pet 1:4). He became man, but He was still "holy, harmless, undefiled, separate from sinners" (Heb 7:26). Evangelicals lower and profane Jesus and immerse Him in the culture, the world's art and music. Jesus takes on their commonality and profanity. Life imitates evangelical art. Affections are shaped by distorted imagination. The incarnated Jesus descends to their level. The feelings in the music give an impression of intimacy and closeness, emphasizing immanence over transcendence. All relations become more egalitarian and less complementary. The words, "I love you," are powerful. The teenaged girls in our church, where I grew up, were warned about them. They were told that boys would try to use those words. They were not just meaningless and a lie without commitment, but they were appalling and revolting. It's good to tell people we love them, but we shouldn't say we love someone if we don't. Jesus said, "If ye love me, keep my commandments" (John 14:15). That wasn't anything different than what He required of Himself. He kept every commandment of His Father -- "not my will, but thine, be done" (Luke 22:42). Biblical love, the only love, is elevated, separated, or unique. The horizontal relationship has become mired and mixed in the dirt, rejecting the hierarchy and respect. It flattens relationship and cheapens love. Love derives from scripture. It comes from above. Love is not a feeling. It is fruit of the Spirit. It has objective meaning. It isn't an arbitrary connection with another person. If the word "love" isn't springing from biblical origins, it shouldn't be used. It's a heinous lie. Be careful with just throwing it around and putting it in regular print unless you are capable of and committed to practicing what you are saying or writing. Egalitarianism neutralizes love. Love elevates God above self, truth above self, and others above self. That isn't horizontal. Scripture itself is above men. To practice love requires submission to God. Love isn't a fancy. It isn't a communal experience that flows through us. It is pure. We're not, so we must depend on God, Who is above us, to live the life of love toward others. The goal isn't a shared feeling. It is the eternal betterment of someone else. That doesn't occur by tolerating others and whatever they might think or do. Walking in the light isn't just keeping it real, attempting not to be a put-on. God is light. Love is doing what God does. When we belittle God to our level with profane worship, we are not more likely to submit to Him. Relationship of God with man hasn't changed. God sets the terms for the relationship. Someone can conform God in His imagination to a God that accepts what he wants in a relationship with God, but that doesn't mean it is a relationship with God. This trickles down to the relationship of people with one another too. Relationship. You can't live without it. You can't live with it. Bad relationship can be torture. I don't have to explain. Everyone reading knows. It can be great, fantastic, and enjoyable. It can be infuriating, frustrating, or sad. It can influence toward either righteousness or evil. It mainly does the latter. We need to know about relationship. We need to know what God says about it. We will be judged by God for and about relationship. Relationship with God is priority and the basis of all human relationship. Relationship starts with God, and that relationship is also the source and model for all successful and fulfilling relationship. The desire for relationship that is inherent in every human being also turns every person into prey, using relationship as bait. People want relationship to the degree that they will pursue inordinate relationship, instead of pleasing God in it. Organizations, including churches, use relationship to pander to an audience. To understand right relationship, everything fundamental to it can be found in the relationship between the Father and the Son in the Trinity, the Godhead. Both the Father and the Son reveal in scripture various components of their relationship with each other in a way sufficient to explain the right kind. Those characteristics of their relationship are teased out further in revelation in scripture about relationship between people. What scripture says should be the guide by which we inform and the grid by which we judge our relationship with God and with people. The relationship with God has been called, and in an accurate and helpful way, a vertical relationship. The relationship with people has been titled, also accurate and helpful, a horizontal relationship. It is also true and edifying to consider the horizontal relationship depends on the vertical relationship. It is good then to see the association between the vertical and the horizontal. Horizontal as a description of human relationship is a bit of a misnomer. Almost all relationship divine and human is what could be called hierarchical, so much so that one should say that relationship is hierarchical. This is also likely the most repulsive aspects of relationship to depraved humanity, and especially today. People resist authority, starting with God. Problem with most relationship is a problem with God, because relationship is hierarchical, as seen in several ways in scripture, not necessarily in this order. This represents the most important relationships in existence: Father to Christ to man to woman. If hierarchy is in the Godhead, then it shouldn't surprise someone that it is also crucial for humanity. The relationship of God to man is "God commanded the man." Jesus, the God-man, did not treat His relationship with the Father differently than what God expects of all men. Three, more than any other gospel, John presents the relationship of Jesus with His Father, and all through the gospel of John, Jesus says He's doing exactly what the Father wants Him to do. The purpose of Jesus was to do the will of His Father, that is what sanctified the Son, and what the Son said sanctified people as well. John 5:19, "The Son can do nothing of himself, but what he seeth the Father do: for what things soever he doeth, these also doeth the Son likewise." John 5:20, "For the Father loveth the Son, and sheweth him all things that himself doeth." John 5:30, "I seek not mine own will, but the will of the Father which hath sent me." John 5:36, "for the works which the Father hath given me to finish, the same works that I do." John 8:28, "I do nothing of myself; but as my Father hath taught me, I speak these things." John 8:29, "And he that sent me is with me: the Father hath not left me alone; for I do always those things that please him." John 8:49, " I honour my Father." John 10:18, "This commandment have I received of my Father." As the Father knoweth me, even so know I the Father: and I lay down my life for the sheep. . . . Therefore doth my Father love me, because I lay down my life, that I might take it again. The Father was also pleased because the Son did what the Father wanted Him to do at His baptism (Matthew 3:15-17). The love of the Father and the pleasure of the Father is attached to the obedience of the Son. The Father and the Son would not have a relationship if one or the other sinned. Since God is at the top if the hierarchy, disobedience to God in relationship is what causes enmity in the relationship. Relationship is not some type arbitrary connection. It is designed by God and what ruins it is what God says ruins it, which is true. It's not for people to decide what disrupts relations. Four, the ten commandments reflect hierarchy. The love of God is seen in the first four commandments, which are essentially valuing God above everything and putting Him ahead of everything. This is the first of the great commandments. The second table starts with "honor thy father and thy mother." Relationship between people is represented in children honoring and obeying their parents. Five, the two tables of the law are mirrored in the New Testament. Ephesians as much as anything is about relationship. God wanted the relationship in the church with each member one with the other, a special focus on the Jews and the Gentiles in chapters 2 and 3, proceeding from their relationship with Him, an "in Christ" relationship. Paul called them one new man, the unity so tight that they were behaving like they were all one Person, Who was Christ. The Apostle Paul breaks down varied relationships as starting with "be filled with the Spirit" (Eph 5:18). All of the relationships represented then in Ephesians 5 and 6 -- husband/wife, parent/child, employer/employee -- spring from submitting to the Holy Spirit. They are all hierarchical. What makes them work is submission, starting with subjection to God. I know many people who want "good relationships" and by that, they mean people treating them well. The same people often have a problem with authority. They don't like hierarchy and don't do well with it. The problem, again and again, "are the people in charge" (their assessment). This parallels the big issue for unbelievers. 2 Peter 2-3 speaks of the typical apostate "speaking evil of dignities." They don't like having a boss and classically they nit-pick those above them. They "walk after their own lust" and scoff at what clashes with their will. They don't deny themselves, aren't thankful, and worship and serve the creature rather than the Creator. All of this will sabotage relationship. If Mr. Turk looked at his quote of the KJV preface in its context, he would see that the translators were arguing for translation contra Romanism, not approving of poor translations. On the other hand, the KJ translators were linguistic scholars by most accounts, yet not quite as reliable themselves as a source for theology. For that reason, I don’t ask WWKJTD (What Would the King James Translators Do?). I do at times puzzle at ardor for a preface as far surpassing the translation of Holy Scripture it introduced. Men as early as seventeenth century decided that both Jesus and the apostles quoted from a Greek version of the Hebrew OT. Like any other historic tradition, we evaluate it with truth (John 17:17). Exegetical reasons say Jesus quoted from the Hebrew text. Jots and tittles are Hebrew letters (Matthew 5:18). Jesus refers to the OT as the law and the prophets, the designation speaking of the Hebrew OT, not a Greek one (Luke 24:44). James affirmed that the Torah was the text by which preaching was done on every Sabbath in every town of Judea, and elsewhere, in the synagogue (Acts 15:21). There is no question that Hebrew was a known and read language of the first century since Pilate required the title on the cross to be written in three known and read languages of the Greco-Roman world—Hebrew and Greek and Latin (Jn. 19:20). The Lord Jesus Christ spoke both Hebrew (“Eli, Eli, lama sabachthani”) and Aramaic (“Eloi, Eloi, lama sabachthani”) from the Cross, as the Gospels of Matthew and Mark testify (Mt. 27:46—Mk. 15:34). The Apostle Paul, in his great apologetic speech, spoke to the Jews in Jerusalem “in the Hebrew tongue” (Acts 21:40). The Lord also spoke to Paul “in the Hebrew tongue” at the time of his conversion (Acts 26:14). Nowhere do we find any similar doctrine of “Greek translation usage,” except to exegete the preface of translation. This paragraph exemplifies how one gets a bibliology of preservation, something you will not see among the critical and eclectic. This historic tradition creates a huge problem for one’s view of inspiration and inerrancy. It says Jesus quotes an extremely flawed translation, especially textually, making error in Scripture “satisfactory.” Then certain points debunk the historic tradition. Many of these OT quotations in the New are significantly different from certain modern Septuagints. Cumulatively a big majority of the quotations from Job, Zechariah, and Malachi agree solely with the Masoretic. This same historic tradition today underlies denial of ipsissima verba of Christ for unorthodox ipsissima vox. A high view of inspiration practices classic harmonization. Often attacks on Scripture point at supposed conflicts with the various accounts to relegate the Bible to something only human. Rather than capitulating to errors, our high view guides viable explanations. In place of the one problematic historic tradition I offer two viable choices (or mixture of the two) that harmonize with God’s promises of perfect preservation. 1. Jesus targummed, that is, He quoted and commented as a rabbi would. Jesus knew the Hebrew and the Greek, so He could translate on a fly, imparting commentary as well, especially His being God Himself, speaking new Scripture based upon His own authority. We witness this Jewish practice of targumming by Jesus in Luke 4:16-21: the teacher stands and opens scroll (vv. 16, 17), reads the OT with running interpretation or Targum (vv. 17b-19), rolls up scroll, hands back, and sits down, and then preaches his sermon (v. 21ff). Several commentators affirm Christ’s employment of the Targum, including Geldenhuys who states (p. 167): “As far as we know, He read in Hebrew and translated into Aramaic, the common spoken language at that time…G. Dalman finds reflections of the traditional Aramaic paraphrase (Targum) in the present passage in Luke [4:18 ff. ].” Cf. also Robert H. Stein, The New American Commentary, Luke (Nashville, Broadman Press, 1992), p. 155; Craig A. Evans, New International Biblical Commentary, Luke (Peabody, MA: Hendrickson Publ., 1990), p. 73; and William Manson, The Moffatt New Testament Commentary, The Gospel of Luke (London: Hodder and Stoughton, Ltd., 1955), p. 41. 2. “[T]he scribes who copied the surviving manuscripts of the LXX [which date after the composition of the gospels] were by and large Christians who would have been familiar with the NT writings. When, in the process of producing a LXX manuscript, they came to a passage that was quoted in the NT, they sometimes adjusted the text, either inadvertently (because of their memory of the NT form) or purposefully (because they assumed the NT form was correct)” (p. 191, Invitation to the Septuagint, Moises Silva and Karen Jobes, Grand Rapids, MI: Baker Books, 2000). Alexandria and Egypt in their Septuagint acclaim Hesychius as their authority, the region from Constantinople to Antioch approves the copies of Lucian the martyr, the intermediate Palestinian provinces read the MSS which were promulgated by Eusebius and Pamphilius on the basis of Origen’s labors, and the whole world is divided among these three varieties of texts. The main value of the LXX is its witness to an older Hebrew text than our own. But before we can reconstruct this Hebrew text we need to have a pure Greek text before us, and this we are at present far from possessing…the original text has yet to be recovered…Not a verse is without its array of variant readings. [T]hey joined them together with the Hebrew original, and the translation of the Seventy (as hath been before signified out of Epiphanius) and set them forth openly to be considered of and perused by all. —which explains the reason for the KJ translators’ Septuagint illustration. Contradicting the Romanists, they believed in the translation of the Hebrew and Greek text into known languages. They weren’t using their conjecture about the Septuagint to endorse a poor translation. Neither the KJ translators, nor many others, would say that a translation in the places where it is faulty is the Word of God. How would that point of their preface apply to modern translations? The KJ translators would support translations into known languages, i.e., ones other than Latin. Perhaps Mr. Turk could just say what he believes about the preservation of Scripture, what God did preserve, and why, so we can stop speculating on what “grammatical promises” are. If he means that God didn’t promise to preserve His Words; i.e. no verbal, plenary preservation, and so he enters this debate with that presupposition, it’s no wonder our conclusions differ. Just saying that preservation isn’t in Scripture doesn’t count as debate—we could both say, “He’s wrong,” and we’d be done. I asked if the Bible was evidence. Mr. Turk implies “Yes” with “merely evidence.” I ask if it is superior to other forms of evidence—no answer. A “plain” answer would include a “yes” or “no.” “Ontologically reliable” and “metaphysically authoritative” aren’t plain. Those two descriptions are about as nebulous as one could get, especially in light of what Scripture says about itself. I think by “ontologically reliable,” he means that the reliability of Scripture is found in its essence and unique nature, but not in the actual, accessible words. I think by saying “metaphysically authoritative” he separates Scripture from the available, physical text itself. If the text of the Bible has no integrity of its own, then readers can have their own way with it—disregard what it says and say what it means to them. Mr. Turk’s answers read like definitional gobbly-gook to allow belief in error in Scripture. Mr. Turk should have seen that what I believe about preservation doesn’t contradict what Turretin said. Neither Turretin nor I believe that copyists were without error. I even gave a Scriptural basis for errors in copies. God said there would be errors. Both Turretin and I believe that those errors were always corrected. Both Turretin and I believe in perfect preservation based upon God’s promises, including a great defense of 1 John 5:7. I still call on Mr. Turk to tell me what he believes about preservation of Scripture and to prove it. While I’m waiting, here are references that among others promise the perfect, Divine preservation of Scripture: Deuteronomy 8:3; Psalm 12:6-7; 111:7-8; 119:152; 119:160; Isaiah 59:21; Matthew 4:4; 5:18-19; 24:35; Mark 13:31; Luke 3:3; 16:17; 21:33; John 12:48; 1 Peter 1:23-25; 2 Peter 3:2. These cumulatively give a stronger testimony for perfect preservation than the Bible even gives for its own inspiration. If you believe the latter, then you should believe the former. In addition, among the above verses and others, we have testimony to the general accessibility of God’s verbally, plenarily preserved Words: Deuteronomy 30:11-14; Isaiah 59:21; Matthew 4:4. Implied in the ability to keep all the Words of God is their availability: Deuteronomy 6:24; 10:2; 12:28; 27:26; 28:14; 28:58; 29:9; 31:12. The Bible affirms that people will be held eternally accountable for disobeying the Words contained therein: Psalm 50:16-17; Luke 24:35; 2 Timothy 3:15-17. This brings us to the matter of God’s ‘singular care and providence’ by which He has ‘kept pure in all ages’ this original text, so that we now actually possess it in ‘authentical’ form. And let us begin by giving an illustration from modern life to show that an original document may be destroyed, without the text of that document being lost. Suppose you were to write a will. Then suppose you were to have a photographic copy of that will made. If the original were then destroyed, the photographic copy would still preserve the text of that exactly the same as the original itself (emphasis his). The text of the copy would differ in no way whatever from the original, and so it would possess exactly the same ‘truth’ and meaning as the original. . . . How then could the original text of the Word of God be preserved? The answer is that God preserved it by His own remarkable care and providence. As a Professor in a Theological Seminary, it has been my duty to make a special study of the Westminster Confession of Faith, as have I done for twenty years; and I venture to affirm that no one who is qualified to give an opinion on the subject, would dare to risk his reputation on the statement that the Westminster divines ever thought the original manuscripts of the Bible were distinct from the copies in their possession (underline mine). See: I like Kent's questions in spite of their insinuations that brief, clear answers of only a few sentences are somehow evasive. What is utterly fascinating about this current question is that Kent wants to imply that unless all the words are present, none of the words are validly considered God's word -- so for Kent, only the words which, for example, Luke wrote down when he scribed the phrase "Epeideper polloi epeceiresan avataxasthai diegesin peri ton peplerophoremenon ev hemin pragmaton" [my note: English transliteration of Luke 1:1 in the Greek New Testament] (that's Luke 1:1 as we account for it) can be God's word. Or can it? Because Luke 1:1 in the KJV reads, "Forasmuch as many have taken in hand to set forth in order a declaration of those things which are most surely believed among us," including the comma, which indicates that Luke 1:1 is not a complete sentence. Apparently, words are missing from that sentence -- so citing that verse by itself, if we are to take Kent seriously in his argument so far, is not citing God's word, but corrupting it. Worse still for Kent is the gross problem that the phrase "Forasmuch as many have taken in hand to set forth in order a declaration of those things which are most surely believed among us" is not what Luke wrote back in the day: that's a translation of what Luke wrote. Since these are not the words that Luke wrote, they must be a corruption of the text. And I say this because, frankly, I have met many ex-KJV guys who would say so -- because they believe that since the KJV is not the original manuscript but some kind of transmitted text, it can't be God's word. It's a common ploy for these men, who are usually atheists, to try to discredit the Scripture because it comes in translation. How can we possibly know those words are right? So we have to decide something up front: is translation a legitimate pursuit when it comes to Scripture? The Muslim, for example, would say "no". You can read the Qu'ran in English, but that's not Scripture. But the clear fact is that the KJV translators believed that translation is a legitimate pursuit for the church of the text for the sake of the common man. For those men, translation was in fact a necessary duty of the church in order to teach the Scripture -- even if the words of the Greek and Hebrew were not perfectly handled. Now, here's the kicker -- the place where we can answer Kent's question without any stipulations. Is the question of translation a matter of making sure the right number of words are being used? In the example of Luke 1:1, Luke wrote 11 words -- yet in English, the phrase is translated using 24 words! If what is at stake is that the very words must be transliterated, I propose that we must conclude that Scripture has been utterly adulterated by the KJV translators, and we must abandon that work because it uses more words than Luke did in Luke 1:1. But that proposition is ludicrous on its face -- because even the most novice of Bible students knows that New Testament Greek is a very different language than Renaissance English. Verbs are formed differently; tenses are built in a different grammatical way; Nouns operate differently; sentence structure is very different. It is inevitable that translating from Greek to English will render different words. That is actually the point of the exercise. In that, it is transparently clear that any text is more than just a list of words. The text uses structures like idioms and metaphors to express meaning not evident in the mere words -- and in many cases, those sorts of structures have to be handled carefully and not merely in a wooden literal sense by the translator to convey the meaning of the author. I reject the idea that Scripture is merely a list of words in a magical order which, when recited, somehow has an effect which one might call "perfection". While we honor and revere the fact that God breathed out the very words of Scripture, I deny that the words, considered individually, are somehow so fragile that human operations like listening, reading, copying, translating or memorizing -- which inevitably make errors in transmitting these words -- will somehow invalidate what God has intended in this special revelation. Because we receive the NT in translation (for example, in the KJV), we must insist that the perfection of Scripture today is found in the message and not the words. The words in which we receive Scripture (that is, English words) were never written by an apostle or prophet. God's promises to preserve His word do not include any grammatical or scribal promises. Scripture is not merely "evidence" but in fact "testimony" -- God's revelation of Truth. Because of where those texts come from -- not because of the words or the languages used -- that testimony is not merely a report of truth: it is the authoritative statement of the truth. The text itself is not so fragile that it must be received as the original autograph; like any text, and as clearly affirmed by Turrentin, "an authentic writing is one in which all things are abundantly sufficient to inspire confidence". This would include scribal copies of autographs which are not identical to the autographs and valid translations. Although any version made by fallible men cannot be considered divine and infallible with respect to the terms, yet it can well be considered such with respect to the things, since it faithfully expresses the divine truth of the sources even as the word which the minister of the gospel preaches does not cease to be divine and infallible and to establish our faith, although it may be expressed by him in human words. Thus faith depends not on the authority of the interpreter or minister, but is built upon the truth and authenticity (authentia) of the things contained in the versions. Turrentin said this about translations into common languages. Why can we not apply what Turrentin said here about translation and apply it to the human method of copying the text by hand? That is, why is this true for the more difficult work of translation, but not the less difficult work of scribal copyists? Everything that is of the greatest benefit to a child of God is most severely attacked by the devil and his cohorts; this is also true of the Lord’s Supper. A heavy cloud of numerous heresies has ascended from the abyss of hell to obscure the essential nature of this sacrament—a cloud which we have driven away in the previous chapter by means of the light of the truth. When the devil can no longer obscure the truth, he then endeavors either to prevent or corrupt the exercise concerning this truth. He does this by bringing all manner of riffraff into the church and leading them to the holy table, knowing that this will seriously impede the blessing (Jer. 5:25–26). He also does this by most vehemently assaulting believers during the time of preparation, thereby causing them to fall into sin and subsequently into unbelief—and by diverting them so that they will neglect to spend time and to be engaged in that to which this time of preparation obligates them. Each believer must therefore be especially on guard during this season and strive to use this sacrament [note: Biblically, "ordinance" is a superior term to "sacrament." Please see the study on the difference by clicking here] to his benefit. To this end it is needful that there be a good preparation for, celebration of, and reflection upon, the Lord’s Supper. Secondly, everyone will be carefully examined at the table as to whether he wears a wedding garment; that is, whether he appears there with the proper frame of heart. “And when the king came in to see the guests, he saw there a man which had not on a wedding garment: and he saith unto him, Friend, how camest thou in hither not having a wedding garment?” (Mat. 22:11–12). It is therefore needful to put on the wedding garment prior to this event in order to be a desirable guest. Thirdly, it is furthermore a duty of an extraordinary nature. One approaches unto God in an extraordinary manner, that is, in a very intimate manner. One comes to the table as a partaker of the covenant in the presence of other partakers of the covenant, sits at the Lord’s table in the light of His countenance, and partakes of the signs and seals of the crucified body and shed blood of the Lord Jesus. And since it is the Lord’s will that He be sanctified in those who approach unto Him, it is needful to consider the following: “Wherewith shall I come before the LORD, and bow myself before the high God?” (Micah 6:6). One must therefore prepare himself in an extraordinary manner for this extraordinary duty. Fourthly, it is also God’s command that he who approaches unto God in an extraordinary manner should also prepare himself to that end. When the Lord was about to descend to the people upon Mount Sinai, the Lord gave command to Moses, saying, “Go unto the people, and sanctify them to day and to morrow, and let them wash their clothes, and be ready against the third day” (Exo. 19:10–11). When Israel was about to cross the Jordan dry-shod by a divine miracle, it was commanded, “Sanctify yourselves: for tomorrow the LORD will do wonders among you” (Josh. 3:5). When Moses approached the burning bush—a symbol of God’s extraordinary presence—he heard the voice, “Put off thy shoes from off thy feet, for the place whereon thou standest is holy ground” (Exo. 3:5). When Samuel invited Jesse and the elders to the sacrifice, he said, “Sanctify yourselves, and come with me to the sacrifice” (1 Sam. 16:5). Whenever the priests would approach unto the altar, they first had to wash themselves. Therefore, we also, when about to approach to the holy table, must first prepare ourselves. Fifthly, it will generally be experienced that a blessing is received after having prepared one’s self. I repeat, generally, for it does occasionally occur that a godly person who neglects preparation until the last moment and ultimately cannot bring himself to be properly engaged therein, in a short time can consciously sink away so deeply in his abominableness, insignificance, and sinfulness; receive the Lord Jesus in such a lively frame, acknowledging free grace; and with such sincerity arise from his sinful state, that he partakes in faith and does receive many conscious encouragements, so that in amazement he exclaims, “Have I also here looked after Him that seeth me?” (Gen. 16:13). On the contrary, it can also happen that a believer who has made much work of preparation, both during the time of preparation and in partaking, remains in the dark, is troubled, and is weak in faith. And even if he received light during the time of preparation, it can happen at the table that a sudden darkness and deadness come upon him, so that he who was encouraged while coming to the table, returns with sorrow to his seat. However, even though this does happen, preparation ought not to be neglected, for it is his duty. One must enter in God’s way, and God generally bestows a blessing upon serious preparation, be it that which one had in view or that which is most beneficial for him at that time. To such a person the promise will be fulfilled, “And ye shall seek Me, and find Me, when ye shall search for Me with all your heart” (Jer. 29:13). The soul will then not accuse itself of slothfulness, but will find peace in her sincere endeavors. From this, one can perceive the necessity of preparation. Even though we may perceive the necessity of preparation, we nevertheless allow ourself to be readily hindered and to be kept from it. (1) This may be done by way of postponement, saying, “Yes, I must, I am willing, and I shall engage myself in preparation; however, I will do it then, at such and such a time when this matter has transpired and after that task has been finished. I am not fit at this moment.” Often, the then does not materialize. Meanwhile, the time which we thought would be available slips away, and before having prepared ourselves, we are overtaken by the event itself. One then finds himself unfit to use the remaining time properly, and will have to attend in such an unprepared fashion. As we proceed to consider the work of preparation, three matters are to be practiced: 1) a stimulating of desire; 2) an examination of self; and 3) spiritual adornment. One must first of all endeavor to stir up a strong desire to be among God’s people, to appear before the Lord with the multitude that keeps holyday, to see the good of His chosen, to rejoice in the gladness of His people, and to glory with His inheritance. How David longed for this! “One thing have I desired of the LORD, that will I seek after; that I may dwell in the house of the LORD all the days of my life, to behold the beauty of the LORD, and to inquire in His temple” (Psa. 27:4); “My soul thirsteth for God, for the living God: when shall I come and appear before God?” (Psa. 42:2). How sorrowful he was when he was deprived of this! “When I remember these things, I pour out my soul in me: for I had gone with the multitude, I went with them to the house of God, with the voice of joy and praise, with a multitude that kept holyday” (Psa. 42:4); “Woe is me, that I sojourn in Mesech, that I dwell in the tents of Kedar!” (Psa. 120:5). How he rejoiced when he was permitted to be among God’s people in the temple! “I was glad when they said unto me, Let us go into the house of the LORD. Our feet shall stand within thy gates, O Jerusalem” (Psa. 122:1–2). Secondly, consider this gathering as being led into the inner chambers (Song of Sol. 1:4) and into the king’s palace (Psa. 45:15), where many wonders are unveiled to the godly which eye has not seen and ear has not heard, which has never entered into the heart of man, and which God has prepared for them that love Him. Oh, what glorious matters the Lord shows them there, and what sweetness He causes them to taste there! There He grants His children a profound insight into the eternal, sovereign pleasure of eternal election: He has known and loved them from eternity and has ordained them to be the recipients of a salvation which passes all understanding. There He reveals to them the covenant of redemption, the Counsel of Peace between Jehovah and the Man whose name is the Branch, together with all the conditions and promises of this covenant, the voluntary surrender of the Son to be a Surety for those elect, and the manner in which this covenant is their certainty and salvation. There He reveals to them His unfathomable wisdom in the way by which He leads them to salvation by first concluding them under sin and permitting them to come into a state in which they completely miss and are estranged from God, from which He afterwards, demonstrating His wondrous mercy, delivers them again. There He reveals to them the work of redemption; there they behold Jesus coming in the flesh, and they follow Him from the manger to the cross—in His preaching, His acts of benevolence, and His suffering and death. Not only do they reflect upon this as a truth, but they do so in a lively, intimate manner, considering the very essence of the matters themselves and all the perfections of God which are revealed in them. They focus on every one of them and are in amazement about every one of them. The Lord reveals to them the wondrous ways in which He has drawn them and led them hitherto. There He reveals something to them of future glory, which at times brings them into ecstasy. There He assures them of, and seals to them, His eternal love and the certainty of their state, letting them depart with a loving kiss of His mouth. Thirdly, consider for a moment the sweet and friendly invitation of the Lord Jesus Himself. He has no need of you; He could have passed you by and have invited others. However, He now says to you, “Come, for all things are ready!” This invitation He accompanies with so many sweet motives—yes, in His Name He beseeches you that you would come to Him. Furthermore, He Himself stands at the door and knocks, waiting for you to open to Him in order that He may sup with you and you with Him (Rev. 3:20). The bride acknowledged this by saying, “I sleep, but my heart waketh: it is the voice of my beloved that knocketh, saying, Open to Me, My sister, My love, My dove, My undefiled: for My head is filled with dew, and My locks with the drops of the night” (Song of Sol. 5:2). Since He calls and invites you in such a friendly manner to have fellowship with Him, would you then yet walk away or remain standing? No, but allow your heart to be set aflame with love for such a gathering, and let your soul, so to speak, fly there with wings. Fourthly, at the Lord’s Supper a public confession of the Lord Jesus is made. It is then that the celebrating church professes publicly before the entire world, and proclaims that Jesus Christ is the only and sufficient Savior, their Head, and their Lord. She commemorates His suffering and death as the only atoning sacrifice, and she declares the death of the Lord to be the only foundation for peace, comfort, and life. It is God’s way to convert men by confessing the Lord Jesus and to thus gather His Church. It is the honor which the Father has awarded the Lord Jesus upon His suffering. A true believer has love for the Lord Jesus, and wherever there is true love, the believer has a desire to say of his Beloved, “This is my Beloved, and this is my Friend” (Song of Sol. 5:16). The Lord Jesus takes careful notice of those who are not ashamed of Him and whose delight it is, together with the church, to confess Him and to live to His honor and glory. He promises that He in turn will confess them before His Father, before the angels, and before the entire world. Since, therefore, the partaking of the Lord’s Supper is a public confession of the Lord Jesus, who would then not be stirred up to be among that people who profess and exclaim that Jesus is King? It is a confession that one would not neglect to make in time of persecution, even if he would have to die for it. Fifthly, one exercises communion with Christ in the Lord’s Supper. Is not that the focus of all your desires, and the essence of your spiritual life? Is not your soul troubled in the absence of such communion? It is there that the Lord Jesus assures believers of being a partaker of Him as well as of His love toward them. It is there that the Holy Spirit generally works in a more perceptible manner. On the one hand, He reveals the promises to them and the marks of those who are heirs thereof, and on the other hand He reveals to them the graces which are to be found in them. Thus, on the basis of God’s Word, He causes them to come to the following conclusion: The Lord promises these specific matters to those who are in such a condition; however, in the presence of God, I perceive such spiritual frames to be within me and therefore these specific promises are for me—and since the Lord is true, He will also fulfil them for me. Furthermore, believers consider the signs of the Lord’s Supper as a seal and pledge by which they are assured that they truly belong to Christ and that Christ is also their portion. At such a moment the Holy Spirit works immediately and witnesses with their spirit that they are the children of God, impressing the Word, the seal, and their conclusion so powerfully upon their heart, that they know that the Lord Jesus loves them. This in turn causes their love to be revived toward Him and they thus exercise intimate fellowship with Christ. “The cup of blessing which we bless, is it not the communion of the blood of Christ? The bread which we break, is it not the communion of the body of Christ?” (1 Cor. 10:16). How all this ought to stir up the believer to partake joyfully of the Lord’s Supper! Sixthly, not only is there a sealing communion with Christ in the Lord’s Supper, but there are also times when one may enjoy extraordinary graces which engender ecstasy. A person may at times, with the disciples, be brought to the holy mountain and see Christ in His glory. Occasionally, the believer is there led into the banqueting house, and Christ spreads His love over him as a banner. He and the Father come and make their abode with him. He causes him at times to dip joyfully into the fountain of salvation, and such corn and wine causes even the lips of the young men and the young daughters to speak. He kisses them with the kisses of His mouth and satisfies them there with the goodness of His house, even of His holy temple. He causes them to sing praises with joyful lips. Therefore, “let him that is athirst come. And whosoever will, let him take the water of life freely” (Rev. 22:17). Seventhly, consider furthermore the blessed company which gathers there, for there God’s children are gathered together before the countenance of their heavenly Father and their beloved Jesus in order to find mutual delight. There they express their love to each other; there they fully separate themselves from the world and despise its love since they find satisfaction in their mutual love for each other. There they express their love, not only for those with whom they are acquainted, but also toward all believers with whom they are not acquainted. They not only unite themselves with all the godly who are present, but also with the angels and with the souls of just men made perfect. “But ye are come unto mount Sion, and unto the city of the living God, the heavenly Jerusalem, and to an innumerable company of angels, to the general assembly and church of the firstborn, which are written in heaven, and to God the Judge of all, and to the spirits of just men made perfect, and to Jesus the Mediator of the new covenant, and to the blood of sprinkling” (Heb. 12:22–24). Even if the world, as their enemy, hates, despises, persecutes, and oppresses them, there is yet no reason for concern; they can readily miss its love, for they have better company and they refresh themselves in a sweet manner in the exercise of mutual love. They confess this unity in the Lord’s Supper by eating of the same bread and by drinking of the same cup. “For we being many are one bread, and one body: for we are all partakers of that one bread” (1 Cor. 10:17). Thus, God’s children may here enjoy a prenuptial celebration. Eighthly, one furthermore gains strength from the Lord’s Supper in sanctification, the mortification of sin, and the living of a life that is pleasing unto the Lord—for the food and drink of this meal yield strength and refreshment. Here faith is strengthened; love is stirred up and becomes more steadfast; and here is union with Jesus, the very life of the soul, and a willing commitment to serve the Lord. The Lord’s Supper obligates one to a childlike obedience and here one becomes enamored with continual fellowship with God—fellowship impeded by sin, but enlivened by the exercise of godliness. Therefore the soul quietly begins to shine as Moses’ countenance did. She is as the bride of Christ, receiving the eyes of a dove to keep her Beloved continually in view and to look away from all that is desirable. It is her desire to please her Beloved, and she therefore yields to His will. If there be then a stirring within, a believer—however sluggish he may be and however many difficulties and objections he may be accustomed to bring forth—ought to be moved to go with longing to the Lord’s Supper and to say with Moses, “I will now turn aside, and see this great sight” (Exo. 3:3). The excerpt above is from Wilhelmus a Brakel's 4 volume systematic theology called The Christian's Reasonable Service, which has been made available in an indexed form online. Relationship originates with God. He is the source and the explication or definer of relationship. Relationship is what God both says it is and what it should be. What matters is what God knows about relationship, not what someone thinks about it. He has missed it if he is happy with his relationship, but God isn't. It isn't about a person's happiness, but about his pleasing God. If a person goes through a short 70-100 year life, less or more, and he doesn't please God with relationship, then he has failed. The eternal relationship with God supersedes all other relationship. No relationship with a person can be right if, first, he doesn't have a right relationship with God, and, second, if his relationship with people isn't what God wants. Someone might like either his relationship with God or with people, and yet God doesn't like it. The first concern for anyone is who he is attempting to please with his relationship. A second threat to relationship comes from how someone either informs or judges relationship. Almost everyone judges relationship today based on what he likes and wants. Then some conform the Bible to what they want as a means of justification of what they want. Just because someone likes his relationships and they make him feel good doesn't mean that God likes them. In the introduction to part one, I talked about how evangelicals today use relationship to pander to people. They tolerate and even laud a wrong relationship that might please their devotees or demographic targets. This audience becomes a victim of a ploy. The apostle Peter portrays their method in 2 Peter 2:3: "through covetousness shall they with feigned words make merchandise of you." They are using "relationship" as part of a sham. "Relationship" churches offer unscriptural relationship under the guise of biblical relationship. People want relationship. This is part of being made in the image of God. Everyone has a vacuum, an innate emptiness, without relationship. If it is filled with God, actual God, the only God, the absence of human relationship can be endured. However, these churches use that desire, and the people who want to get that kind of a relationship are actually just getting gotten, taken advantage of by people. The fraudulent relationship isn't tested by scripture. Testing the relationship is what isn't acceptable. It's a "good" relationship because the adherents like the relationship. It please them. Relationship itself becomes the goal, having one, one that pleases those in the relationship. They both like what they get from it. It isn't based on the Bible. When someone does apply the Bible, that is what becomes the problem then with and for the relationship. The churches that emphasize this "relationship" create opportunities or forums for "relationship." There is a Christian cloak to it all, to justify its existence, but the lure is the music and recreation and entertainment that the target audience would like. "Love," not a biblical love, is getting together and enjoying the same thing without judgment. Everyone is tolerated and they all feel good because of it. The feeling is assumed to be the Holy Spirit. These churches strategically say their opposition cares more about rules than relationship. God had rules for Cain when Cain wanted a relationship. He resented God for it. Rules are an enemy of this kind of relationship. Tolerance in relationship has grown exponentially in "evangelical" churches. Dress how you want. Dancing. Even cursing. The Bible doesn't forbid a four letter word. The saltiness in speech is just someone being genuine, not attempting to put on airs, as a modern Pharisee might. The movement provides an ecstatic spiritual experience like what the Corinthians enjoyed. More than anything, don't judge. Don't give anyone disapproval. What is not tolerated is disapproval, because that is poison to "relationship." God wants relationship, so the poison to the relationship, disapproval, must be rejected. Evangelicals have deconstructed relationship like the postmoderns. They've taken the terms and redefined them. "Light" is no longer holiness or purity, obedience to scripture, but a kind of honesty about what's really bothering you. Sharing what's a burden or a problem. Someone might be judging you for doing something the Bible doesn't forbid, like watching Game of Thrones. These restrictions are just the painted on spirituality of hypocrites. Authenticity is light. This is a form of liberalism, where terms like "light" are allegorized, subjective and a-historical. It's actually what the cults do and the basis of new, false religions. Social networking is perfect for faux relationship. No one lasts online by rebuking bad behavior. The only bad behavior is intolerance. It's all positive all the time. It's easy to join and keep racking up followers or supporters if you don't judge anything they do, again, except the intolerance of those who point out something sinful and admonish it. The relationship strategy is akin to a gym, which welcomes fat people and offers them pizza. By creating a no judgment zone. No one needs to improve or even work up a sweat. Many of the same characters who appreciate the "relationship" churches would think those gyms are a joke. When a worldview is wrong, it's always full of contradictions like these. "I love you" doesn't really mean, "I love you." It means, I accept you like you are. You don't need to change. You're fine like you are. Love rejoices in the truth and rejoices not in iniquity. It speaks the truth. The "relationship" church says, love casts out fear. They don't mean what the verse in 1 John means. They mean that "relationship" means no fear, especially not the fear of authority, proceeding from God. The fear of 1 John, the apostle John, the apostle of love, is the fear of the world. If you love God, you'll do right, even with the threat of the world, because you love God. His commandments won't be burdensome to you (1 John 5:3). The "relationship" church says, you shouldn't have to fear intolerance of your bad behavior. Their teaching is a total perversion which is part of the perverted "love" of these "relationship" churches. The person who really loves you won't approve of your sin and might bring fearsome confrontation, like God did on Mt. Sinai, because he loved Israel. What I've been describing constitutes a large and growing number of professing churches today. They are especially sucking up millennials and gen-Zers who once attended more historical Bible believing and practicing churches. There are a number of factors, as I see it, some far more negative than others. First, young people want acceptance from their peers. They don't like the feelings of rejection from the world, which is worse than ever for biblical Christianity. These "relationship" churches offer them what they want, the no judgment zone. Their own former churches are old and square, full of people who don't really "get it." Very often these young people have to trash and scorched-earth those churches, their former churches, to justify moving ahead. Most of them will regret it later. The relationship churches encourage it. Guiding others to reject historical Christianity, their old churches, they call spiritual help, which poses as helping others see the "light" (the Freudian light as described above). Second, some of the young people that have flocked to the "relationship" churches also very often weren't seeing much occur in their own church, perhaps were not being grounded scripturally, and they were getting a hard time from their parents and other authority in the church, often a combination of all three. Parents may have "pushed them away" with some regrettable carnal weaponry, out of frustration and some anger. The "relationship" church gives approval and "respect." It isn't actual respect, because that requires a hierarchy that starts with the true God. If the relationship was about God, it would be careful with scripture and care greatly about what God said about everything. What is ironic for "relationship" people in their "relationship" churches is a bad relationship with parents, parents who want to reconcile with them. In the second table of the law, the primary relationship is with parents. Honor thy Father and thy Mother. If you are not honoring your parents, then your relationship stinks. You may think that your parents aren't so hot. That is typical of a lot of millennials and gen-Zers, who put respect of themselves above all others, and listen almost exclusively, like the very failed Rehoboam, to either people their age who approve of them or people a little older who are using them by giving them the approval they crave. They are making merchandise of them, perhaps justifying their own view of the world by gaining a coalition of adherents (people who will drink their koolaid). Read Proverbs and its agreement with the foundational relationship of parents to children. Today's generation of young people had a lot of expectation of parents, desirous of parents who will please them as children. Likely the parents have sacrificed a lot for the children, even if they haven't been the best parents. They've not done more than God, but what have the children done for the parents? And scripture doesn't require much of the parents except to raise children to follow the Lord, to attempt to make them and help them to do right. The requirement in the ten commandments is for the children to honor their parents, not vice versa, but children today act like the command is the reverse. These are the most fruitful target audience of "relationship" churches. It should be tell-tale to anyone with discernment, the control of the Holy Spirit or scripture, that churches that encourage conflict with Christian parents are false. These relationship churches feed the discontent of the young to divide them from their parents. The goal should be reconciliation and biblical relationship -- honor thy father and thy mother. Whatever gap in communication between parents and children should be mediated, giving a hearing to both the child and the mom and dad. It is no kind of Christian counseling that excludes the parents and especially listens solely to a young person with no hearing of his parents. In the last days, men shall be lovers of themselves and disobedient to parents. This describes the era in which we live. If you still claim to be a Christian, you should consider that, because that can't be you if you are saved. If it is you, then like Paul wrote in 2 Corinthians 13:5, you should examine yourself whether you are in the faith. Every person will stand before God and God will judge his relationship. God is judging relationships. Someone might have relationships and like them. In the end, what matters is whether God was pleased by them. To come back to my point. Relationship proceeds from what scripture says about relationship. It must be the authority for relationship. It wasn't with Adam in the garden, so he abdicated headship and Eve did what she wanted. The relationship between man and woman became cursed. The only way back is still a biblical way. That's what I want to write about relationship as we move forward in this series. This Bible contains massive amounts of material about relationship and if relationship doesn't conform to that, it isn't relationship at all. Happiness isn't the goal in life and relationships don't guarantee happiness. I'm not saying that relationships aren't important. One can argue, and I said this in part one, that we are created by God for relationship -- first with Him and then with one another. We should explore what scripture says about relationship to learn what God wants with it. God said that it was not good that man should be alone, but relationship is also fraught with possible pitfalls. All relationship starts with God. God commanded Adam and Eve not to eat of the tree of the knowledge of good and evil. God commanded that. That was God's relationship with Adam and Eve. They didn't obey that command and we know that his and her relationship with each other influenced that. Later Jesus said in Luke 14:26, "If any man come to me, and hate not his father, and mother, and wife, and children, and brethren, and sisters, yea, and his own life also, he cannot be my disciple." The relationship with God must supersede all other relationship. The English word "relationship" isn't in the Bible. "Fellowship" is the biblical term, which is helpful here. Fellowship is not about "getting along." Most people do fine in relationships when they get approval and acceptance. Ephesians 5:11 says, "And have no fellowship with the unfruitful works of darkness, but rather reprove them." If you walk in the light as God is in the light (cf. 1 John 1:7), you don't have fellowship with darkness. I have seen relationship become the operative word so that fellowship continues with darkness. Someone wants to be "happy," so he continues a relationship with darkness. The Greek word translated "fellowship" sometimes is translated "communion." Paul asks in 2 Corinthians 6:14, "what communion hath light with darkness?" The assumed answer is "none." Actual fellowship isn't happening for light with darkness. Light and darkness are mutually exclusive. Only light has fellowship (communion). To treat yourself as if you were someone you were responsible for helping is, instead, to consider what would be truly good for you. This is not "what you want." It is also not "what would make you happy." Every time you give a child something sweet, you make that child happy. That does not mean that you should do nothing for children except feed them candy. "Happy" is by no means synonymous with "good." You must get children to brush their teeth. They must put on their snowsuits when they go outside in the cold, even though they might object strenuously. You must help a child become a virtuous, responsible, awake, being capable of full reciprocity -- able to take care of himself and others, and to thrive while doing so. Why would think it acceptable to do anything less for yourself? People say relationship is most important to happiness, but parents who are living with children score low on happiness. Raising children decreases the happiness of parents. Americans are having fewer children. Polls show people are less happy with marriage and less are getting married. Biblical marriage and parenting require unhappiness. A child isn't going to be happy when his parents don't like what he did. Christ loves the church by sanctifying and cleansing it (Eph 5:25-26). That's an example of the husband and wife relationship, which very often isn't happy. Ephesians 6:1 commands, "Children, obey your parents in the Lord: for this is right," not "for this will make you happy." Happiness is a byproduct, but it isn't a goal, and it's only a byproduct for people with the right goal. If the goal is obedience, and you're obedient, then you'll be happy, like Jesus said in John 13:17, "If ye know these things, happy are ye if ye do them." In Cain's relationship with God, he wasn't happy when God disrespected his offering. He "was very wroth, and his countenance fell" (Genesis 4:5). He wasn't getting what he wanted and rather than adapt to what God said, He resented what God said and out of resentment, killed his brother. The instinct toward relationship is good. Relationship exists eternally in the Godhead. God created man in His image. God wants relationship between men like He has in the Godhead. The Bible explains very clearly what that relationship is. I've been asked various people whether we saw different spots in Rome, some of which I've said, "No." At this point in our trip, we had been several places in England, then Scotland and Venice. With a mixed group of four, we discovered that it was best to slow down and not look at so much. When you do that, you make choices not to see something. I don't know how much different it would have made. I liked visiting Rome, and I would go back, but it wouldn't bother me if I never made it back either. Some places seem like they are worth going back to. Two places we didn't see that come to mind are the Mamertine Prison and the catacombs. We had a thought that we might do the latter attached to a bike ride, but I found on our last day that we couldn't fly from Rome to Paris. There was an air traffic control strike that weekend. This definitely throws a wrench into a European tour, trying to figure out how now to get from Rome to Paris, when I had never been overseas until this trip. Because of that strike, everybody trying to get into Paris was being affected that weekend. I'll tell you later how that ended. I didn't mention in the last post that we ate at a restaurant in the neighborhood on Thursday night, June 14. What we wanted was something authentic Italian that the locals liked. This was Romolo e Remo, and it was good. Everything we had in Italy, Venice and Rome, was good. I liked it all, but nothing stood out above anything that I had in the United States. I was ready to be impressed and wanted to like it better than anything ever. It was all good. 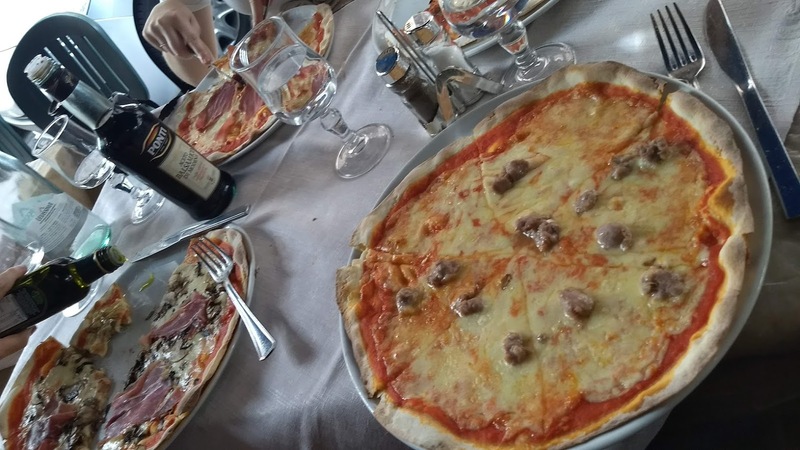 I liked the pasta, the pizza, everything I had in Italy. Nothing was bad. You are in good hands with Italy for Italian food (as if you wouldn't have known that anyway). You don't get any kind of chain food feel in Italian restaurants. They seem like they care that you like what they're doing and giving to you. 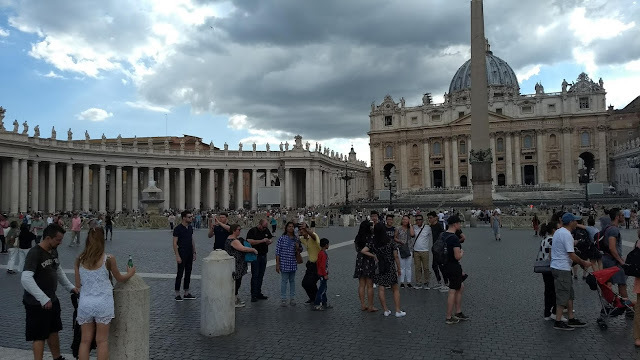 We pre-purchased tickets to the Vatican museum after the normal closing time, so we would enter at 7:15pm, and we planned Friday, June 15, around that. The first day we had taken a heart-of-Rome walk and got only as far as Piazza Colonna, and we picked up where we left off, so that we would see the Trevi Fountain and then the Spanish steps before we made our way over the Tiber River by bus. 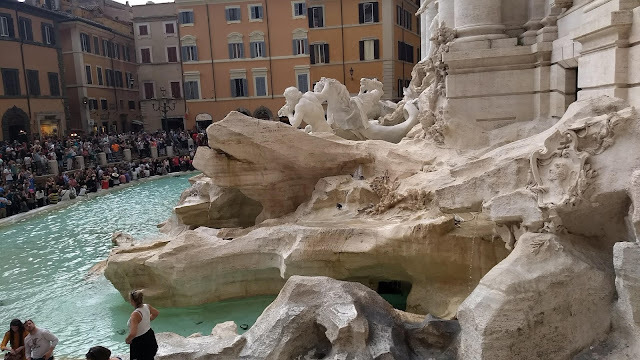 Rome is a city of many, many fountains and the Trevi fountain is considered the most famous of them all, designed by Nicola Salvi and completed by Giuseppe Pannini in 1762. It is gigantic and there is a huge crowd pressing against it. No one can step into this fountain and the police presence is conspicuous. Someone tried and the reaction from the authorities was instant. One of the traditions is to throw a coin into this found over the shoulder. It's supposed to mean that you'll return to Rome. The coins are collected and used for poor people during the year. 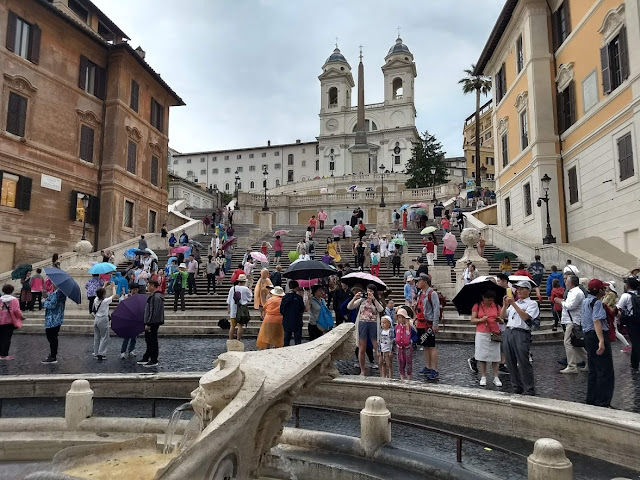 From there we walked to the Spanish steps and made our way all the way from bottom to top and back to bottom. The top gives a very nice view of the city of Rome. In the distance, you see the dome of St. Peter's Basilica. 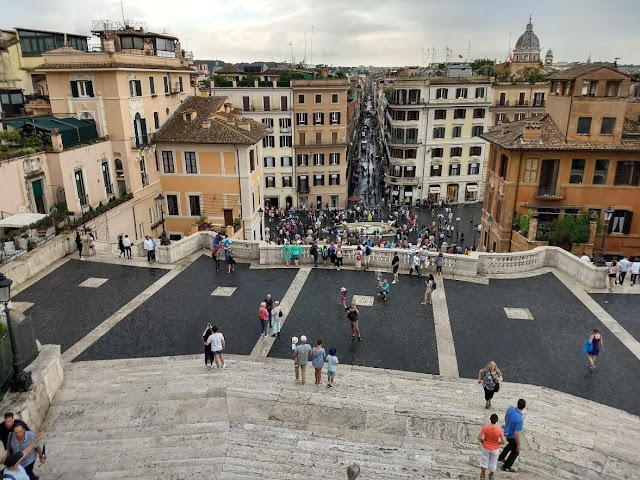 From the Spanish steps, we caught a bus to get near the Vatican, which is surrounded by a wall. First, our plan was a late lunch or early supper someplace close to Vatican City. It wasn't crowded there that time of day and, as we walked and looked, a lot of them looked about the same. One of the regular practices was for someone to look at the rating on tripadvisor, and again, they were all about the same. We stopped to eat outdoor on the sidewalk at Trattoria Pizzeria La Caravella di Magistri Luigi. Yes, all those words. We had time after eating to go into St. Peter's Basilica. We went into a lot of Cathedrals on this trip. In many ways, they all look the same. The most massive, as one might understand, was St. Peter's, which is in essence the headquarters for Roman Catholicism. It's the biggest in the world. It is a massive piece of architecture, the square itself with gigantic columns done by the same person who did a lot of the major buildings we saw on the trip, Bernini. The line was very long, but it moved. It's free to go in and they keep you moving. In the square, you see a giant statue of Peter, which, of course, no one knows how he looked. Besides the immensity of St. Peter's outside and in, one work of art inside is well known. When you walk in, just to the right is the Pieta, by Michelangelo. Of course, statues of Jesus are violations of the second commandment and then all of Europe, especially Rome, elevates Mary to great heights. Despite that, I understand why the piece is famous and moving. Looking at it, one feels sorry for Mary, and in all the sermons I've preached about Mary in the various gospel accounts, especially Luke, I feel great pain for Jesus' mother. Michelangelo captures something there. We walked through quickly, having seen enough, and then made our way around to the entrance to the Vatican Museum. You may be asking why someone would go there? We wanted to see the Sistine chapel among other aspects of it. Our entrance came with a tour. She was Italian and speaking English, but difficult to understand. 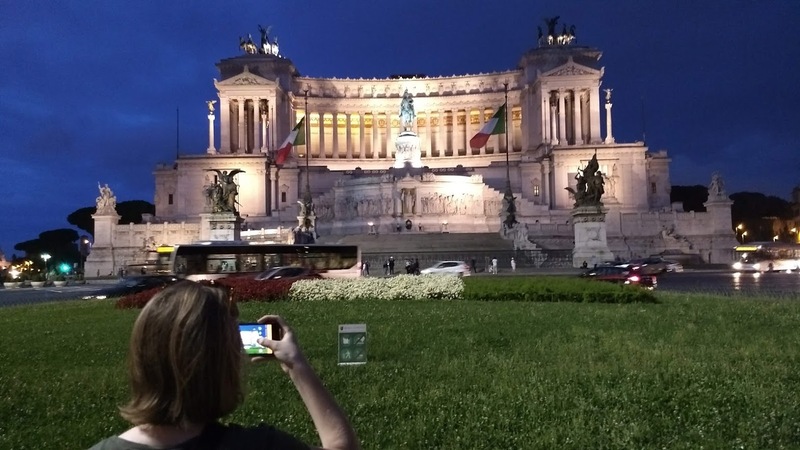 Pictures could be taken up to a certain point, including the Vatican area. However, once you get into the museum, you can't take pictures anymore. Some of the art in the museum is the greatest. As soon as you walk in, the spiral staircase is impressive. In the papal apartments are famous large frescoes of Raphael and Michelangelo, among the former's The School of Athens is impressive. Before you walk into the Sistine chapel, you are warned not to talk and not to take pictures. People talk and take pictures. The guards look angry, because they said, don't talk and people do it anyway. It's normal for tourists. I stood and just stared everywhere in the Sistine chapel. What struck me was that the renowned ceiling was lower then I imagined and the whole room was smaller. It was still very large and high, but just smaller and lower than I imagined. Everywhere was something amazing. Again, I do think that God and Adam is blasphemous. The story of the Bible is all over the room and done in an amazing way. I wish I could have sat there with a guide and got a four hour explanation without all the people in there. I was happy to have seen it. We left there and took various busses to get home. We found ourselves as we did a few times, waiting next to Vittorio Emanuele II Monument, which is lit up at night, very impressive. We ate some gelato, caught our bus, and rode close to home. We packed. We would leave early the next day, Saturday, June 16.